I had the honor of hosting the first RFP Financial Fitness Forum earlier and it was such a good program that I learned and re-learned much from the best minds of the Registered Financial Planner Institute. Kudos to Henry Ong and the RFP team for enlightening over 300 participants of the forum. Instead of doing a summary of the forum, I will re-post below all the posts I made through my twitter which highlights a lot of the learning I picked up. I used the hash tag #rfpfinancialfitness as well. Here goes! Efren Cruz cites dangers of all the euphoria in our investments environment, too much hot money vs. low foreign direct investments. 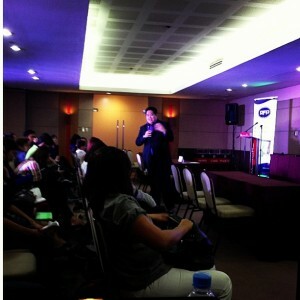 Efren Cruz talks about his free personal finance app, now available at symbian and android and soon for iOs. Exciting! @pesosandsense Aya Laraya gives #rfpfinancialfitness participants an update of the investment markets. Banking is good business, making them good stock picks. Banking stocks are good because they benefit from strong inflows plus low interest rates as consumers may be encouraged to buy more. The investment grade will most likely attract Foreign Direct Investments. Some people spend a lot of time & energy trying to find the best investment; ignoring the more fundamental issues in finance. We need to upgrade our financial education because we are now in a new world & a new world requires new solutions. “When you’re young you can invest in equities because if you lose money, you still have your parents.” Ricky So – funny guy! There were so much more learning but it was hard listening, taking down notes, tweeting, taking photos and hosting all at the same time so this will do for now. The next event you should not miss is iCon 2013: The No Nonsense Investments Conference on June 22 at the SMX! Click HERE. Thanks for posting this recap here! I was there yesterday and had a lot of fun. Learned so much from the speakers and you are a great, super funny host 🙂 I hope this becomes an annual event. I’ll see you, Efren, and Marvin again at iCon 2013! These are great nuggets of Financial wisdom! Why didn’t I hear about this forum..